Choose an additional Sentry host. Perform a rolling restart on the cluster. Using a rolling restart instead of manually shutting down the cluster minimises downtime. Note that even with a rolling restart, the Sentry service stops and restarts. 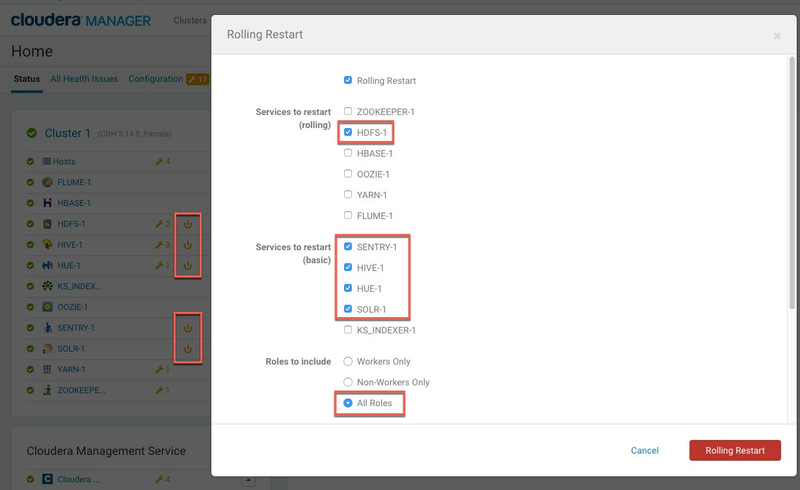 For more information about using Cloudera Manager to perform a rolling restart, see Rolling Restart. For more information about Sentry high availability, see Sentry High Availability. You must have HDFS high availability enabled. For information about configuring HDFS high availability, see HDFS High Availability. In Cloudera Manager, open the Sentry service. The following image shows the location of the Sentry service on an example cluster. Click the Sentry service name to open the service. The following image shows the host options. In this example, sentryexample-1 is the current host and we are adding sentryexample-2 as the alternate host. The following image shows the example cluster with the services that have stale configurations selected, as well as the All Roles option. The red boxes also show the location of the stale configuration markers in Cloudera Manager. The following image shows the example cluster with Sentry high availability enabled. There are two Sentry hosts running.